This tutorial will deal with the difficult task of filling shapes and adding borders. If you think it's too advanced for you, just stick with the other tutorials on this site for now and come back later. There's no need to be ashamed, only few people have the skill to master this art. Use the selection-tool of your choice to create a nice selection. 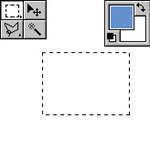 In this example i pressed M once, what made me able to use the rectangle selection tool. 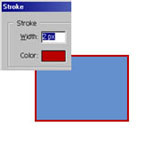 Remember that you can add and substract selections by holding Shift or Alt while selecting. Now decide what color your shape should get and pick it. Hint: Just click on your Foregroundcolor and the Colorpicker will pop up. Now all you have to do, is to fill the selection with your color. There are many ways to do this, i always use the Alt+Backspace shortcut. 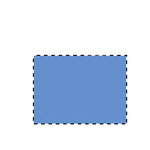 If you do not want your shape to be merged with the background, just create a new layer before by pressing Ctrl+Shift+N or by choosing Layer -> New -> Layer. You are finished by now, but could add some variations, too. For example pick another color and use Edit -> Stroke to add a lineout. Remember, that you can even add a stroke to your selection, if it's not filled.